Radio telescope data of the oddball supernova SN 2007gr, which behaves somewhat like a gamma-ray burst, without the gamma-rays. The image was taken with the European Very Long Baseline Interferometry (E-VLBI) Network, with data from the Green Bank Telescope overlaid in the contour lines. Scientists have observed a peculiar type of star death indeep space that may help explain the most powerful explosions in the universe. The blast, called a supernova, didn't behave as most suchexplosions do. In some ways it seemed similar to a sub-class of supernovacalled gamma-raybursts, which are the most energetic outbursts known, and can acceleratematerial to extreme speeds. But instead of a vast amount of high-energy gamma ray lightpouring from the star, which would be expected for gamma-ray bursts, thescientists saw the supernova?s explosion in lower-energy radio waves. "We think that radio observations will soon be a morepowerful tool for finding this kind of supernova in the nearby universe thangamma-ray satellites," said Alicia Soderberg, of the Harvard-SmithsonianCenter for Astrophysics in Cambridge, Mass. Soderberg led the team that observed the blast, using theNational Science Foundation's Very Large Array (VLA) radio telescope in NewMexico. "Our observations? 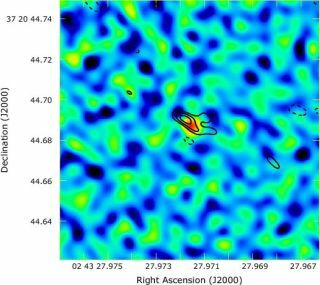 providenew clues for the understanding of how supernovae explode, and how some of themmay be related to the even more energetic gamma-ray bursts," saidco-researcher Zsolt Paragi of the Joint Institute for VLBI (Very Long BaselineInterferometry) in Europe (JIVE), based in the Netherlands. The new observations showed material expelled from the supernovaexplosion, dubbed SN2009bb, at speeds approaching that of light. Thischaracterized the blast, first seen last March, as the type thought to produceone kind of gamma-ray burst. Supernovas occur when the nuclear fusion reactions at thecores of very massive stars no longer can provide the energy needed to hold thecore up against the weight of the rest of the star, and so the core collapsesinto a superdense neutron star or black hole. Meanwhile, the rest of the star'smaterial is blown out into space in a massive explosion. Only about one of out of a hundred of this type of supernovaproduce gamma-ray bursts, though, which are characterized by having anextremely powerful engine that can accelerate some of the ejected material upto nearly the speed of light. Until now, no such "engine-driven" supernova hadbeen found any way other than by detecting gamma rays emitted by it. "Discovering such a supernovaby observing its radio emission, rather than through gamma rays, is abreakthrough. With the new capabilities of the Expanded VLA coming soon, webelieve we'll find more in the future through radio observations than withgamma-ray satellites," Soderberg said. The scientists aren't sure why they didn't see gamma-rayscoming from this pseudo gamma-ray burst, but suggested that it might just havebeen a problem of orientation: The gamma-rays in such explosions generally flyout in distinct jet streams, and maybe in this case the jet streams weren'tpointed at Earth. "Another possibility is that the gamma rays were'smothered' as they tried to escape the star," Soderberg said. "Thisis perhaps the more exciting possibility since it implies that we can find andidentify engine-driven supernovae that lack detectable gamma rays and thus gounseen by gamma-ray satellites." The researchers reported their findings in the Jan. 28 issueof the journal Nature.